Dwell Magazine: Santa Monica-based Konig Eizenberg Architecture’s design for Los Angeles Abbey Apartments will provide housing for 115 formerly homeless individuals in downtown Los Angeles. 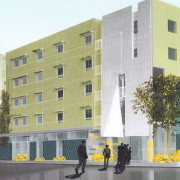 Affordable Housing Finance: The Rainbow Apartments is a valiant effort by Skid Row Housing Trust to serve Los Angeles’ neediest at a time when market-rate loft developers have pushed into downtown, snatched up the available properties, and begin gentrifying the area. LA Times – The Nation: L.A. hopes residential facilities with on-site support will alleviate chronic homelessness.